Kumano Sanzan is the name of three top Kumano Shrines (Kumano Hongu Taisya, Kumano Nachi Taisya and Kumano Hayatama Taisya). It is located in southern Wakayama Prefecture. 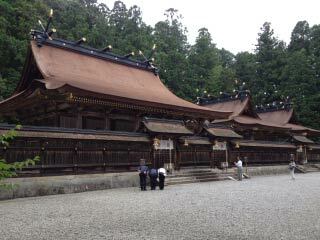 Kumano Sanzan is one of the most respected shrines and considered as the most sacred location in the history of Japan. The sacred pass at Kumano appears in Japanese Myth, and the Yata Crow of Kumano Shrine is considered as the messenger of God and lead us to the victory. Worshiping those three sacred shrines have been very popular since Heian, and done by many people including the imperial family, nobles, Samurai and citizens. The faith of Kumano is still highly respected. The worshiping pass and these three shrines are designated as UNESCO World Heritage Sites. When you worship at Kumano Sanzan, you will feel the beautiful sprits of nature, and that is the reason that Kumano Sanzan considered as the most sacred place in Japan. If you try walking though the old pass of Kumano, you can even feel the history of Japan. Also, at Nachi Taisya, don't miss Nachi Falls that is the one of three major waterfalls in Japan.